These highlights do not include all the information needed to use Olopatadine Hydrochloride Nasal Spray safely and effectively. See full prescribing information for Olopatadine Hydrochloride Nasal Spray. Nasal spray 0.6%: 665 mcg of olopatadine hydrochloride in each 100- microliter spray. (3) Supplied as a 30.5 g bottle containing 240 sprays. Epistaxis, nasal ulceration, and nasal septal perforation. Monitor patients periodically for signs of adverse effects on the nasal mucosa. Discontinue if ulcerations or perforations occur. Avoid use in patients with nasal disease other than allergic rhinitis (5.1). Avoid engaging in hazardous occupations requiring complete mental alertness and coordination such as driving or operating machinery when taking Olopatadine Hydrochloride Nasal Spray (5.2). Avoid concurrent use of alcohol or other central nervous system depressants with Olopatadine Hydrochloride Nasal Spray (5.2). The most common (>1%) adverse reactions included bitter taste, headache, epistaxis, pharyngolaryngeal pain, post-nasal drip, cough, and urinary tract infection in patients 12 years of age and older and epistaxis, headache, upper respiratory tract infection, bitter taste, pyrexia, and rash in patients 6 to 11 years of age (6.1). To report SUSPECTED ADVERSE REACTIONS, contact Sandoz, Inc. at 1-800-525-8747 or FDA at 1-800-FDA-1088 or www.fda.gov/medwatch. Olopatadine Hydrochloride Nasal Spray is an H receptor antagonist indicated for the relief of the symptoms of seasonal allergic rhinitis in adults and children 6 years of age and older. Administer Olopatadine Hydrochloride Nasal Spray by the intranasal route only. Priming: Before initial use, prime Olopatadine Hydrochloride Nasal Spray by releasing 5 sprays or until a fine mist appears. When Olopatadine Hydrochloride Nasal Spray has not been used for more than 7 days, re-prime by releasing 2 sprays. Avoid spraying Olopatadine Hydrochloride Nasal Spray into the eyes. Olopatadine Hydrochloride Nasal Spray is a nasal spray solution supplied in a white plastic bottle with a metered-dose manual spray pump, a white nasal applicator, and a blue overcap. Each spray (100 microliters) delivers 665 mcg of olopatadine hydrochloride. Epistaxis and Nasal Ulceration: In placebo (vehicle nasal spray)-controlled clinical trials of 2 weeks to 12 months duration, epistaxis and nasal ulcerations were reported [see Adverse Reactions (6)]. Three placebo (vehicle nasal spray)-controlled long term (12 months) safety trials were conducted. In the first safety trial, patients were treated with an investigational formulation of Olopatadine Hydrochloride Nasal Spray containing povidone (not the commercially marketed formulation) or a vehicle nasal spray containing povidone. Nasal septal perforations were reported in one patient treated with the investigational formulation of Olopatadine Hydrochloride Nasal Spray and 2 patients treated with the vehicle nasal spray. In the second safety trial with Olopatadine Hydrochloride Nasal Spray, which does not contain povidone, there were no reports of nasal septal perforation. In the third safety trial, one patient exposed to the 3.7 pH vehicle nasal spray (containing no povidone) reported a nasal septal perforation [see Adverse Reactions (6)]. Before starting Olopatadine Hydrochloride Nasal Spray, conduct a nasal examination to ensure that patients are free of nasal disease other than allergic rhinitis. Perform nasal examinations periodically for signs of adverse effects on the nasal mucosa and consider stopping Olopatadine Hydrochloride Nasal Spray if patients develop nasal ulcerations. In clinical trials, the occurrence of somnolence has been reported in some patients taking Olopatadine Hydrochloride Nasal Spray [see Adverse Reactions (6)]. 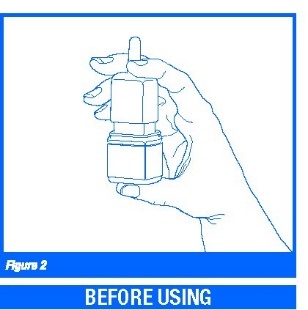 Patients should be cautioned against engaging in hazardous occupations requiring complete mental alertness and motor coordination such as driving or operating machinery after administration of Olopatadine Hydrochloride Nasal Spray. Concurrent use of Olopatadine Hydrochloride Nasal Spray with alcohol or other central nervous system depressants should be avoided because additional reductions in alertness and additional impairment of central nervous system performance may occur. The safety data described below reflect exposure to Olopatadine Hydrochloride Nasal Spray in 2,770 patients with seasonal or perennial allergic rhinitis in 10 controlled clinical trials of 2 weeks to 12 months duration. The safety data from adults and adolescents are based upon 6 placebo (3.7 pH vehicle nasal spray or 7.0pH vehicle nasal spray)-controlled clinical trials in which 1,834 patients with seasonal or perennial allergic rhinitis (652 males and 1,182 females) 12 years of age and older were treated with Olopatadine Hydrochloride Nasal Spray two sprays per nostril twice daily. There were 1,180 patients (Olopatadine Hydrochloride Nasal Spray, 587; vehicle nasal spray, 593) that participated in 3 efficacy and safety trials of 2 weeks duration. There were 2,840 patients (Olopatadine Hydrochloride Nasal Spray, 1,247; 3.7 pH vehicle nasal spray, 1,251; 7.0 pH vehicle nasal spray, 342) that participated in 3 long-term clinical trials of 1 year duration. The racial distribution of adult and adolescent patients receiving Olopatadine Hydrochloride Nasal Spray was 77% white, 9% black, and 14% other. The incidence of discontinuation due to adverse reactions in these controlled clinical trials was comparable for Olopatadine Hydrochloride Nasal Spray and vehicle nasal spray. Overall, 4.7% of the 1,834 adult and adolescent patients across all 6 studies treated with Olopatadine Hydrochloride Nasal Spray, 3.5% of the 1,844 patients treated with 3.7 pH vehicle nasal spray discontinued due to adverse reactions, and 2.9% of the 342 patients treated with 7.0 pH vehicle nasal spray discontinued due to adverse reactions. The safety data from pediatric patients 6-11 years of age are based upon 3 clinical trials in which 870 children with seasonal allergic rhinitis (376 females and 494 males) were treated with Olopatadine Hydrochloride Nasal Spray 1 or 2 sprays per nostril twice daily for 2 weeks. The racial distribution of pediatric patients receiving Olopatadine Hydrochloride Nasal Spray was 68.6% white, 16.6% black, and 14.8% other. The incidence of discontinuation due to adverse reactions in these controlled clinical trials was comparable for Olopatadine Hydrochloride Nasal Spray and vehicle nasal spray. Overall, 1.4% of the 870 pediatric patients across all 3 studies treated with Olopatadine Hydrochloride Nasal Spray and 1.3% of the 872 pediatric patients treated with vehicle nasal spray discontinued due to adverse reactions. Safety information for pediatric patients 2 to 5 years of age is obtained from one vehicle-controlled study of 2 weeks duration [See Pediatric Use (8.4)]. There were 1,180 patients 12 years of age and older (Olopatadine Hydrochloride Nasal Spray, 587; vehicle nasal spray, 593) that participated in 3 efficacy and safety trials of 2 weeks duration. Table 1 presents the most common adverse reactions (0.9% or greater in patients treated with Olopatadine Hydrochloride Nasal Spray) that occurred more frequently in patients treated with Olopatadine Hydrochloride Nasal Spray compared with vehicle nasal spray in the 3 clinical trials of 2 weeks duration. There were 1,742 pediatric patients 6 to 11 years of age (Olopatadine nasal spray, 870; vehicle nasal spray, 872) with seasonal allergic rhinitis that participated in 3 clinical trials of 2 weeks duration. Two of the studies used the investigational formulation of olopatadine nasal spray, and one of the studies used Olopatadine Hydrochloride Nasal Spray. One study evaluated the safety of Olopatadine Hydrochloride Nasal Spray at doses of 1 and 2 sprays per nostril twice daily in 1188 patients, in which 298 were exposed to Olopatadine Hydrochloride 1 spray, 296 were exposed to Olopatadine Hydrochloride 2 sprays, 297 were exposed to vehicle 1 spray, and 297 were exposed to vehicle 2 sprays twice daily for 2 weeks. Table 2 presents the most common adverse reactions (greater than 1.0% in pediatric patients 6-11 years of age treated with Olopatadine Hydrochloride Nasal Spray 1 spray/nostril) that occurred more frequently with Olopatadine Hydrochloride Nasal Spray compared with vehicle nasal spray. The safety of Olopatadine Hydrochloride Nasal Spray at a dose of 1 spray per nostril twice daily was evaluated in one 2- week vehicle-controlled study in 132 patients (Olopatadine Hydrochloride Nasal Spray, 66; vehicle nasal spray. 66) 2 to 5 years of age with allergic rhinitis [see Pediatric Use (8.4)]. In a 12-month, placebo (vehicle nasal spray)-controlled, safety trial, 890 patients 12 years of age and older with perennial allergic rhinitis were randomized to treatment with Olopatadine Hydrochloride Nasal Spray 2 sprays per nostril twice daily (445 patients) or vehicle nasal spray (445 patients). In the Olopatadine Hydrochloride and vehicle nasal spray groups, 72% and 74% of patients, respectively, completed the trial. Overall, 7% and 5%, respectively, discontinued study participation due to an adverse event. The most frequently reported adverse reaction was epistaxis, which occurred in 25% of patients treated with Olopatadine Hydrochloride Nasal Spray and 28% in patients treated with vehicle nasal spray. Epistaxis resulted in discontinuation of 0.9% of patients treated with Olopatadine Hydrochloride Nasal Spray and 0.2% of patients treated with vehicle nasal spray. Nasal ulcerations occurred in 10% of patients treated with Olopatadine Hydrochloride Nasal Spray and 9% of patients treated with vehicle nasal spray. Nasal ulcerations resulted in discontinuation of 0.4% of patients treated with Olopatadine Hydrochloride Nasal Spray and 0.2% patients treated with vehicle nasal spray. There were no patients with nasal septal perforation in either treatment group. Somnolence was reported in 1 patient treated with Olopatadine Hydrochloride Nasal Spray and 1 patient treated with vehicle nasal spray. Weight increase was reported in 6 patients treated with Olopatadine Hydrochloride Nasal Spray and 1 patient treated with vehicle nasal spray. Depression or worsening of depression occurred in 9 patients treated with Olopatadine Hydrochloride Nasal Spray and in 5 patients treated with vehicle nasal spray. Three patients, two of whom had pre-existing histories of depression, who received Olopatadine Hydrochloride Nasal Spray were hospitalized for depression compared to none who received vehicle nasal spray. In a second 12-month, placebo (vehicle nasal spray)-controlled, safety trial, 459 patients 12 years of age and older with perennial allergic rhinitis were treated with 2 sprays per nostril of an investigational formulation of Olopatadine Hydrochloride Nasal Spray containing povidone (not the commercially marketed formulation) and 465 patients were treated with 2 sprays of a vehicle nasal spray containing povidone. Nasal septal perforations were reported in one patient treated with the investigational formulation of Olopatadine Hydrochloride Nasal Spray and 2 patients treated with the vehicle nasal spray. Epistaxis was reported in 19% of patients treated with the investigational formulation of Olopatadine Hydrochloride Nasal Spray and 12% of patients treated with vehicle nasal spray. Somnolence was reported in 3 patients treated with the investigational formulation of Olopatadine Hydrochloride Nasal Spray compared to 1 patient treated with vehicle nasal spray. Fatigue was reported in 5 patients treated with the investigational formulation of Olopatadine Hydrochloride Nasal Spray compared to 1 patient treated with vehicle nasal spray. In a third 3-arm 12-month, placebo (vehicle nasal spray)-controlled, safety trial conducted post approval, 1,026 patients 12 years of age and older with perennial allergic rhinitis were randomized to treatment with Olopatadine Hydrochloride Nasal Spray (343 patients), a 3.7 pH vehicle nasal spray (341 patients), or a 7.0 pH vehicle nasal spray (342 patients). All treatments were administered as 2 sprays per nostril, twice daily. Overall, 5% of Olopatadine Hydrochloride Nasal Spray patients, 2% of 3.7 pH vehicle patients and 3% of 7.0 pH vehicle patients discontinued due to adverse events. The most frequently reported adverse event was epistaxis, which occurred in 24% of patients treated with Olopatadine Hydrochloride Nasal Spray, 20% of patients treated with 3.7 pH vehicle nasal spray, and 23% of patients treated with 7.0 pH vehicle nasal spray. Epistaxis resulted in the discontinuation of 2 patients treated with Olopatadine Hydrochloride Nasal Spray and 1 patient treated with 7.0 pH vehicle nasal spray. Nasal septal perforation was reported for one patient treated with the 3.7 pH vehicle nasal spray. Nasal ulcerations occurred in 9% of patients treated with Olopatadine Hydrochloride Nasal Spray, 8% of patients treated with 3.7 pH vehicle nasal spray, and 9% of patients treated with 7.0 pH vehicle nasal spray. Nasal ulceration resulted in the discontinuation of 1 patient treated with Olopatadine Hydrochloride Nasal Spray. Hyposmia and anosmia were each reported by one patient treated with Olopatadine Hydrochloride Nasal Spray. Neither somnolence nor weight loss was reported. Depression occurred in 3 patients treated with Olopatadine Hydrochloride Nasal Spray, 2 patients treated with 3.7 pH vehicle nasal spray, and 3 patients treated with 7.0 pH vehicle nasal spray. During the post approval use of Olopatadine Hydrochloride Nasal Spray, the following adverse reactions have been identified. Because these reactions are reported voluntarily from a population of uncertain size, it is not always possible to reliably estimate their frequency or establish a causal relationship to drug exposure. The most common adverse reactions reported include dizziness, dysgeusia, epistaxis, headache, nasal discomfort, oropharyngeal pain, and somnolence. Additionally, hyposmia and anosmia have been reported with the use of Olopatadine Hydrochloride Nasal Spray. Formal drug-drug interaction studies were not conducted for Olopatadine Hydrochloride Nasal Spray. Drug interactions with inhibitors of liver enzymes are not anticipated because olopatadine is eliminated predominantly by renal excretion. Drug interactions involving P450 inhibition and plasma protein binding are also not expected. [See Clinical Pharmacology (12.3)]. No adequate and well-controlled studies in pregnant women have been conducted. Animal reproductive studies in rats and rabbits revealed treatment-related effects on fetuses or pups. Because animal studies are not always predictive of human responses, Olopatadine Hydrochloride Nasal Spray should be used in pregnant women only if the potential benefit to the mother justifies the potential risk to the embryo or fetus. A decrease in the number of live fetuses was observed in rabbits and rats at the oral olopatadine doses approximately 88 times and 100 times the maximum recommended human dose (MRHD) and above, respectively, for adults on a mg/m2 basis. In rats, viability and body weights of pups were reduced on day 4 post partum at the oral dose approximately 100 times the MRHD for adults on a mg/m2 basis, but no effect on viability was observed at the dose approximately 35 times the MRHD for adults on a mg/m2 basis. Olopatadine has been identified in the milk of nursing rats following oral administration. It is not known whether topical nasal administration could result in sufficient systemic absorption to produce detectable quantities in human breast milk. Olopatadine Hydrochloride Nasal Spray should be used by nursing mothers only if the potential benefit to the patient outweighs the potential risks to the infant. The safety and effectiveness of Olopatadine Hydrochloride Nasal Spray has not been established for patients under 6 years of age. The safety of olopatadine nasal spray was evaluated in 3 vehicle-controlled 2-week studies in 870 patients 6 to 11 years of age [see Adverse Reactions (6.1)]. Doses studied included 1 and 2 sprays per nostril twice daily. One of these studies evaluated the safety of Olopatadine Hydrochloride Nasal Spray at doses of 1 and 2 sprays per nostril twice daily in 1188 patients, of which, 298 patients were exposed to Olopatadine Hydrochloride 1 spray and 297 patients were exposed to vehicle 1 spray. In this study, the incidence of epistaxis with Olopatadine Hydrochloride Nasal Spray treatment was 5.7%, compared to 3.2% seen in adult and adolescent studies. This study also evaluated the effectiveness of Olopatadine Hydrochloride Nasal Spray in patients 6 through 11 years of age with seasonal allergic rhinitis [see Clinical Studies (14)]. The safety of Olopatadine Hydrochloride Nasal Spray at a dose of 1 spray per nostril twice daily was evaluated in one 2-week vehicle-controlled study in 132 children ages 2 to 5 years of age with allergic rhinitis. In this trial, 66 patients (28 females and 38 males) were exposed to Olopatadine Hydrochloride Nasal Spray. The racial distribution of patients receiving Olopatadine Hydrochloride Nasal Spray was 66.7% white, 27.3% black, and 6.4% other. Two patients exposed to vehicle nasal spray discontinued due to an adverse reaction (1 patient with pneumonia and 1 patient with rhinitis) compared to no patients exposed to Olopatadine Hydrochloride Nasal Spray. The most common (greater than 1.0%) adverse events reported were diarrhea (9.1%), epistaxis (6.1%), rhinorrhea (4.5%), bitter taste (3.0%) and wheezing (3.0%). Diarrhea was reported less frequently (< 1%) in the 6 to 11 year old age group. The incidence of epistaxis was higher in the pediatric population (5.7% in 6-11 year old patients and 6.1% in 2-5 year old patients) compared to the adult and adolescent population (3.2%). Clinical studies of Olopatadine Hydrochloride Nasal Spray did not include sufficient numbers of patients aged 65 years and older to determine whether they respond differently from younger patients. Other reported clinical experience has not identified differences in responses between the elderly and younger patients. In general, dose selection for an elderly patient should be cautious, reflecting the greater frequency of decreased hepatic, renal, or cardiac function and of concomitant disease or other drug therapy. There have been no reported overdosages with Olopatadine Hydrochloride Nasal Spray. Acute overdosage with this dosage form is unlikely due to the configuration of the primary container closure system. However, symptoms of antihistamine overdose may include drowsiness in adults and, initially, agitation and restlessness, followed by drowsiness in children. There is no known specific antidote to Olopatadine Hydrochloride Nasal Spray. Should overdose occur, symptomatic or supportive treatment is recommended, taking into account any concomitantly ingested medications. No mortality was observed in rats at an intranasal dose of 3.6 mg/kg (approximately 6 times the MRHD for adults and adolescents â‰¥12 years of age and 7 times the MRHD for children 6-11 years of age on a mg/m2 basis), or in dogs at an oral dose of 5 g/kg (approximately 28,000 times the MRHD for adults and adolescents â‰¥12 years of age and 33,000 the MRHD for children 6-11 years of age on a mg/m2 basis). The oral median lethal dose (MLD) in mice and rats were 1,490 mg/kg and 3,870 mg/kg respectively (approximately 1,200 times and 6,500 times the MRHD for adults and adolescents â‰¥12 years of age and 1,500 times and 7,700 times the MRHD for children 6-11 years of age, on a mg/m2 basis, respectively). Olopatadine Hydrochloride Nasal Spray contains 0.6% w/v olopatadine (base) in a nonsterile aqueous solution with pH of approximately 3.7. After initial priming (5 sprays), each metered spray from the nasal applicator delivers 100 microliters of the aqueous solution containing 665 mcg of olopatadine hydrochloride, which is equivalent to 600 mcg of olopatadine (base) [see Dosage Forms and Strengths (3)]. Olopatadine Hydrochloride Nasal Spray also contains benzalkonium chloride (0.01%), dibasic sodium phosphate, edetate disodium, sodium chloride, hydrochloric acid and/or sodium hydroxide (to adjust pH), and purified water. Cardiac effects: In a placebo-controlled cardiovascular safety study, 32 healthy volunteers received 20 mg oral solution of olopatadine twice daily for 14 days (8-fold greater daily dose than the recommended daily nasal dose). The mean QTcF (QT corrected by Fridericia's correction method for heart rate) change from baseline was -2.7 msec and -3.8 msec for olopatadine, and placebo, respectively. In this study, 8 subjects treated with olopatadine had a QTcF change from baseline of 30 - 60 msec, 1 subject had a QTcF change from baseline greater than 60 msec, and no subjects had QTcF values greater than 500 msec. Eight subjects treated with placebo had a QTcF change from baseline of 30 - 60 msec, no subjects had a QTcF change from baseline greater than 60 msec, and no subjects had QTcF values greater than 500 msec. In a 12-month study in 429 perennial allergic rhinitis patients treated with Olopatadine Hydrochloride Nasal Spray 2 sprays per nostril twice daily, no evidence of any effect of olopatadine hydrochloride on QT prolongation was observed. Healthy Subjects: Olopatadine was absorbed with individual peak plasma concentrations observed between 30 minutes and 1 hour after twice daily intranasal administration of Olopatadine Hydrochloride Nasal Spray. The mean ( ± SD) steady-state peak plasma concentration (Cmax) of olopatadine was 16.0 ± 8.99 ng/mL. Systemic exposure as indexed by area under the curve (AUC0-12) averaged 66.0 ± 26.8 ng·h/mL. The average absolute bioavailability of intranasal olopatadine is 57%. The mean accumulation ratio following multiple intranasal administration of Olopatadine Hydrochloride Nasal Spray was about 1.3. Seasonal Allergic Rhinitis (SAR) Patients: Systemic exposure of olopatadine in SAR patients after twice daily intranasal administration of Olopatadine Hydrochloride Nasal Spray was comparable to that observed in healthy subjects. Olopatadine was absorbed with peak plasma concentrations observed between 15 minutes and 2 hours. The mean steady-state Cmax was 23.3 ± 6.2 ng/mL and AUC0-12 averaged 78.0 ± 13.9 ng·h/mL. Distribution: The protein binding of olopatadine was moderate at approximately 55% in human serum, and independent of drug concentration over the range of 0.1 to 1000 ng/mL. Olopatadine was bound predominately to human serum albumin. Metabolism: Olopatadine is not extensively metabolized. Based on plasma metabolite profiles following oral administration of [14C] olopatadine, at least six minor metabolites circulate in human plasma. Olopatadine accounts for 77% of peak plasma total radioactivity and all metabolites amounted to <6% combined. 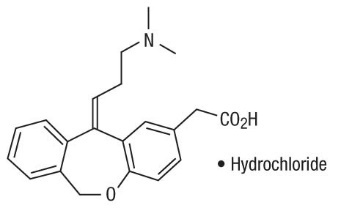 Two of these have been identified as the olopatadine N-oxide and N-desmethyl olopatadine. In in vitro studies with cDNA-expressed human cytochrome P450 isoenzymes (CYP) and flavin-containing monooxygenases (FMO), N-desmethyl olopatadine (Ml) formation was catalyzed mainly by CYP3A4, while olopatadine N-oxide (M3) was primarily catalyzed by FMO1 and FMO3. Olopatadine at concentrations up to 33,900 ng/mL did not inhibit the in vitro metabolism of specific substrates for CYP1A2, CYP2C9, CYP2C19, CYP2D6, CYP2E1 and CYP3A4. The potential for olopatadine and its metabolites to act as inducers of CYP enzymes has not been evaluated. Elimination: The plasma elimination half-life of olopatadine is 8 to 12 hours. Olopatadine is mainly eliminated through urinary excretion. Approximately 70% of a [14C] olopatadine hydrochloride oral dose was recovered in urine with 17% in the feces. Of the drug-related material recovered within the first 24 hours in the urine, 86% was unchanged olopatadine with the balance comprised of olopatadine N-oxide and N-desmethyl olopatadine. Hepatic Impairment: No specific pharmacokinetic study examining the effect of hepatic impairment was conducted. Since metabolism of olopatadine is a minor route of elimination, no adjustment of the dosing regimen of Olopatadine Hydrochloride Nasal Spray is warranted in patients with hepatic impairment. Renal Impairment: The mean Cmax values for olopatadine following single intranasal doses were not markedly different between healthy subjects (18.1 ng/mL) and patients with mild, moderate and severe renal impairment (range 15.5 to 21.6 ng/mL). Mean plasma AUC0-12 was two-fold higher in patients with severe impairment (creatinine clearance <30 mL/min/1.73 m2). In these patients, peak steady-state plasma concentrations of olopatadine are approximately 10-fold lower than those observed after higher 20 mg oral doses, twice daily, which were well-tolerated. These findings indicate that no adjustment of the dosing regimen of Olopatadine Hydrochloride Nasal Spray is warranted in patients with renal impairment. Age: Pediatric Patients 6 to 11 Years of Age: The systemic pharmacokinetics of olopatadine, olopatadine N-oxide and Ndesmethyl olopatadine in patients 6 through 11 years of age were characterized using data from 42 pediatric patients administered Olopatadine Hydrochloride Nasal Spray, one spray per nostril twice daily for a minimum of 14 days. The mean Cmax (15.4 ± 7.3 ng/mL) of olopatadine was approximately 2-fold less than was comparable to that observed in adults (78.0 ± 13.9 ng·h/mL). The Cmax and AUC0-12 of olopatadine N-oxide were comparable to that observed in adults. The Cmax and AUC0-12 of N-desmethyl olopatadine are approximately 18% and 37% higher than that observed in adults, respectively. Pediatric Patients 2 to 5 Years of Age: The systemic pharmacokinetics of olopatadine, olopatadine N-oxide, and N-desmethyl olopatadine were characterized using population pharmacokinetic methods applied to sparse data (approximately 5 samples per patient) obtained from 66 pediatric patients (2 to less than 6 years of age) administered one-half the recommended adult dose (1 spray per nostril) of Olopatadine Hydrochloride Nasal Spray twice daily for a minimum of 14 days. The mean Cmax and AUC0-12 of olopatadine were 13.4 ± 4.6 ng/mL and 75.0± 26.4 ng*hr/mL respectively. The mean Cmax and AUC0-12 of olopatdine N-oxide and N-desmethyl olopatadine were similar to that of patients 6 to 11 years of age. Olopatadine administered orally was not carcinogenic in mice and rats at doses of up to 500 mg/kg/day and 200 mg/kg/day, respectively (approximately 420 and 340 times the MRHD for adults and adolescents â‰¥12 years of age and 500 and 400 times the MRHD for children 6-11 years of age by intranasal administration on a mg/m2 basis, respectively). Olopatadine administered orally to male and female rats at dose of 400 mg/kg/day, (approximately 680 times the MRHD for adults on a mg/m2 basis) resulted in a decrease in the fertility index and reduced implantation rate. No effects on fertility were observed at dose of 50 mg/kg/day (approximately 85 times the MRHD for adults on a mg/m2 basis). Olopatadine was not teratogenic in rabbits and rats at oral doses of up to 400 or 600 mg/kg/day, respectively (approximately 1,400 and 1,000 times the MRHD for adults on a mg/m2 basis, respectively). However, a decrease in the number of live fetuses was observed in rabbits at the oral olopatadine doses of 25 mg/kg (approximately 88 times the MRHD for adults on a mg/m2 basis) and above, and in rats at oral doses of 60 mg/kg (approximately 100 times the MRHD for adults on a mg/m2 basis) and above. In rats, viability and body weights of pups were reduced on day 4 post partum at the oral doses of 60 mg/kg (approximately 100 times the MRHD for adults on a mg/m2 basis) and above, but no effect on viability was observed at the dose of 20 mg/kg (approximately 35 times the MRHD for adults on a mg/m2 basis). The efficacy and safety of Olopatadine Hydrochloride Nasal Spray were evaluated in three randomized, double blind, parallel group, multicenter, placebo (vehicle nasal spray)-controlled clinical trials of 2 weeks duration in adult and adolescent patients, 12 years of age and older with symptoms of seasonal allergic rhinitis. The three clinical trials were conducted in the United States and included 1,598 patients (556 males, and 1,042 females) 12 years of age and older. In these three trials 587 patients were treated with Olopatadine Hydrochloride Nasal Spray 0.6%, 418 patients were treated with Olopatadine Hydrochloride Nasal Spray 0.4%, and 593 patients were treated with vehicle nasal spray. Assessment of efficacy was based on patient recording of 4 individual nasal symptoms (nasal congestion, rhinorrhea, itchy nose, and sneezing) on a 0 to 3 categorical severity scale (0 = absent, 1 = mild, 2 = moderate, 3 = severe) as reflective or instantaneous scores. Reflective scoring required patients to record symptom severity over the previous 12 hours; the instantaneous scoring required patients to record symptom severity at the time of recording. The primary efficacy endpoint was the difference from placebo in the percent change from baseline in the average of morning and evening reflective total nasal symptom score (rTNSS) averaged for the 2-week treatment period. In all 3 trials, patients treated with Olopatadine Hydrochloride Nasal Spray, two sprays per nostril, twice-daily, exhibited statistically significantly greater decreases in rTNSS compared to vehicle nasal spray. Results for the rTNSS from two representative trials are shown in Table 3. Itchy eyes and watery eyes were evaluated as secondary endpoints but eye redness was not evaluated. In two of the studies, patients treated with Olopatadine Hydrochloride Nasal Spray had significantly greater decreases in reflective symptom scores for itchy eyes and watery eyes, compared to vehicle nasal spray. In the 2-week seasonal allergy trials, onset of action was also evaluated by instantaneous TNSS assessments twice-daily after the first dose of study medication. In these trials, onset of action was seen after 1 day of dosing. Onset of action was evaluated in three environmental exposure unit studies with single doses of Olopatadine Hydrochloride Nasal Spray. In these studies, patients with seasonal allergic rhinitis were exposed to high levels of pollen in the environmental exposure unit and then treated with either Olopatadine Hydrochloride Nasal Spray or vehicle nasal spray, two sprays in each nostril, after which they self-reported their allergy symptoms hourly as instantaneous scores for the subsequent 12 hours. Olopatadine Hydrochloride Nasal Spray 0.6% was found to have an onset of action of 30 minutes after dosing in the environmental exposure unit. There were 3 clinical trials of 2 weeks duration with olopatadine nasal spray in patients 6 to 11 years of age with seasonal allergic rhinitis. Efficacy of Olopatadine Hydrochloride Nasal Spray was evaluated in 2 of the 3 trials. One of the 2 trials that showed efficacy was a randomized, double blind, parallel group, multicenter, placebo (vehicle nasal spray)-controlled clinical trial of 2 weeks duration including 1,188 children ages 6 to < 12 years with seasonal allergic rhinitis. Assessment of efficacy was based on patient/caregiver recording of 4 individual nasal symptoms (nasal congestion, rhinorrhea, itchy nose, and sneezing) on a 0 to 3 categorical severity scale (0 = absent, 1 = mild, 2 = moderate, 3 = severe) as reflective or instantaneous scores. Reflective scoring captured symptom severity over the previous 12 hours; the instantaneous scoring captured symptom severity at the time of recording. The primary efficacy endpoint was the difference from placebo in the percent change from baseline in the average of patient/caregiver-reported morning and evening reflective total nasal symptom score (rTNSS) averaged for the 2-week treatment period. Patients treated with Olopatadine Hydrochloride Nasal Spray, 1 or 2 sprays per nostril twice daily, had statistically significantly greater decreases in rTNSS compared to vehicle nasal spray. Results for rTNSS are shown in Table 4. Itchy eyes and watery eyes were evaluated as secondary endpoints in the same study but eye redness was not evaluated. Patients treated with Olopatadine Hydrochloride Nasal Spray had significantly greater decreases in reflective symptom scores for itchy eyes and watery eyes, compared to vehicle nasal spray. 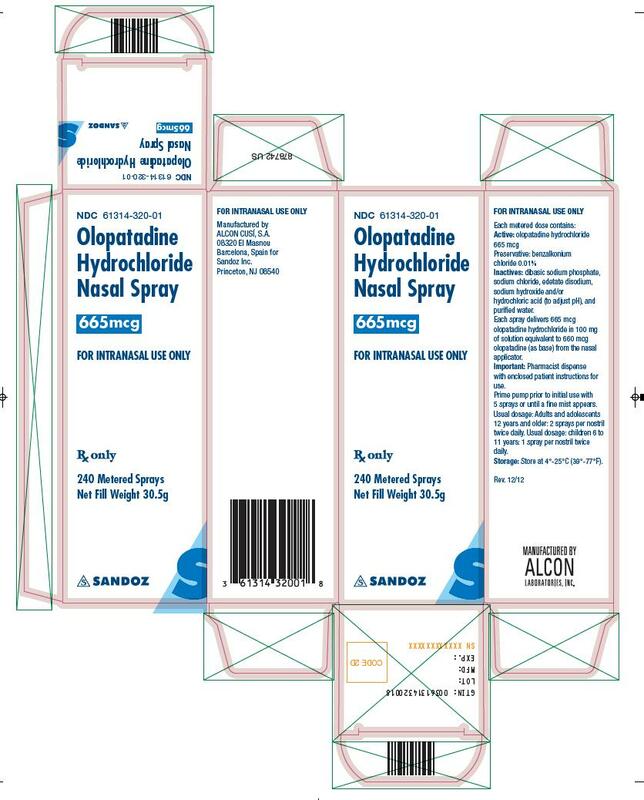 Olopatadine Hydrochloride Nasal Spray, 665 mcg is supplied in a white plastic bottle with a metered-dose manual spray pump, a white nasal applicator and a blue overcap in a box of 1 (NDC 61314-320-01). Each bottle contains 30.5 g of clear, colorless liquid and will provide 240 metered sprays. After priming [see Dosage and Administration (2)], each spray delivers a fine mist containing 665 mcg of olopatadine hydrochloride in 100 microliters of formulation through the nozzle. Before initial use, prime Olopatadine Hydrochloride Nasal Spray by releasing 5 sprays or until a fine mist appears. After periods of non-use greater than 7 days, re-prime Olopatadine Hydrochloride Nasal Spray by releasing 2 sprays. The correct amount of medication cannot be assured before the initial priming and after 240 sprays have been used, even though the bottle is not completely empty. The nasal device should be discarded after 240 sprays (enough for 30 days of dosing) have been used. Store at 4°-25°C (39°-77°F). Rx Only. Inform patients that treatment with Olopatadine Hydrochloride Nasal Spray may lead to adverse reactions, which include epistaxis and nasal ulcerations [see Warnings and Precautions (5.1)]. Other common adverse reactions reported with use of Olopatadine Hydrochloride Nasal Spray include bitter taste, headache, and pharyngolaryngeal pain [see Adverse Reactions (6)]. Somnolence has been reported in some patients taking Olopatadine Hydrochloride Nasal Spray. Patients should be cautioned against engaging in hazardous occupations requiring complete mental alertness and motor coordination such as driving or operating machinery after administration of Olopatadine Hydrochloride Nasal Spray [see Warnings and Precautions (5.2)]. Advise patients that concurrent use of Olopatadine Hydrochloride Nasal Spray with alcohol or other central nervous system depressants should be avoided because additional reductions in alertness and additional impairment of central nervous system performance may occur [see Warnings and Precautions (5.2)]. Inform patients to avoid spraying Olopatadine Hydrochloride Nasal Spray in their eyes. 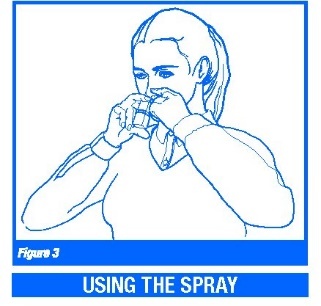 For Use in the nose (Intranasal) only. Read the Patient Information that comes with Olopatadine Hydrochloride Nasal Spray carefully before you start using it and each time you get a refill. There may be new information. This leaflet does not take the place of talking to your health care provider about your medical condition or your treatment. What is Olopatadine Hydrochloride Nasal Spray? Olopatadine Hydrochloride Nasal Spray is a prescription medicine used to provide relief of seasonal allergy symptoms in adults and children 6 years and older. Olopatadine Hydrochloride Nasal Spray contains an antihistamine medicine that may help reduce nasal symptoms of seasonal allergic rhinitis. What should I tell my health care provider before taking Olopatadine Hydrochloride Nasal Spray? • allergic to any of the ingredients in Olopatadine Hydrochloride Nasal Spray. See the end of this leaflet for a complete list of the ingredients in Olopatadine Hydrochloride Nasal Spray. • pregnant or planning to become pregnant. It is not known if Olopatadine Hydrochloride Nasal Spray will harm your unborn baby. • breast-feeding a baby. It is not known if Olopatadine Hydrochloride Nasal Spray passes into your breast milk. Tell your health care provider about all the medicines you take, including prescription and nonprescription medicines, vitamins, and herbal products. Olopatadine Hydrochloride Nasal Spray and other medicines may affect each other, causing side effects. How should I use Olopatadine Hydrochloride Nasal Spray? • Olopatadine Hydrochloride Nasal Spray is for use in the nose only. Do not spray it in your eyes or mouth. • Use Olopatadine Hydrochloride Nasal Spray exactly as your health care provider tells you. Do not stop taking Olopatadine Hydrochloride Nasal Spray without talking to your health care provider. • This nasal device should be discarded after the labeled number of sprays (240) or after the expiration date on the medicine label or box. • Do not use Olopatadine Hydrochloride Nasal Spray after the expiration date on the medicine label and box. Follow the Patient Instructions for Use below. What are the possible side effects of Olopatadine Hydrochloride Nasal Spray? These are not all of the possible side effects of Olopatadine Hydrochloride Nasal Spray. For more information, ask your health care provider or pharmacist. What should I avoid while using Olopatadine Hydrochloride Nasal Spray? Olopatadine Hydrochloride Nasal Spray can make you sleepy. Medicines are sometimes prescribed for conditions that are not mentioned in the patient leaflet. Do not use Olopatadine Hydrochloride Nasal Spray for a condition for which it was not prescribed. Do not give Olopatadine Hydrochloride Nasal Spray to other people, even if they have the same symptoms you have. It may harm them. This patient information leaflet summarizes the most important information about Olopatadine Hydrochloride Nasal Spray. If you would like more information about Olopatadine Hydrochloride Nasal Spray talk with your health care provider. You can ask your health care provider or pharmacist for information about Olopatadine Hydrochloride Nasal Spray that is written for health professionals. For more information call 1-800-757-9195. What are the ingredients of Olopatadine Hydrochloride Nasal Spray? Active ingredient: olopatadine hydrochloride 665 micrograms per 100 microliter spray. Inactive ingredients: 0.01% benzalkonium chloride, sodium phosphate, dibasic, edentate disodium, sodium chloride, hydrochloric acid, sodium hydroxide and water. What should I know about seasonal allergic rhinitis? "Rhinitis" means inflammation of the lining of the nose. Seasonal allergic rhinitis is sometimes called "hay fever". Seasonal allergic rhinitis can be caused by allergies to pollen. If you have allergic rhinitis, your nose becomes stuffy, runny and itchy. You may also sneeze a lot. You may also have red, itchy, watery eyes and itchy throat, or blocked itchy ears. Use Olopatadine Hydrochloride® Nasal Spray exactly how your doctor tells you to. The usual dose of Olopatadine Hydrochloride Nasal Spray for people ages 12 and older is two sprays in each nostril, two times each day and for children 6 to 11, one spray in each nostril two times a day. 1. Remove the blue plastic overcap (Figure 1). 2. 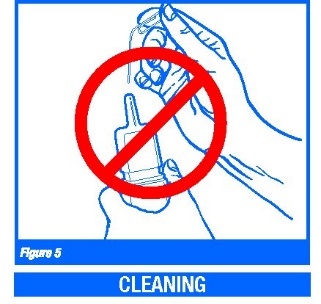 Hold the bottle and press down on the shoulders of the white nasal applicator with your forefinger and middle finger. 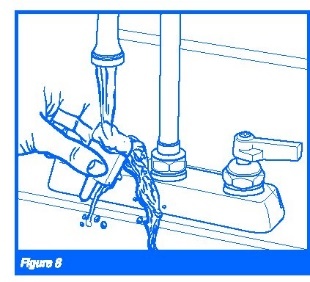 Support the bottom (base) of the bottle with your thumb while you do this (Figure 2). Prime the bottle five (5) times or until you see a fine mist come out of the nasal spray applicator. After you start using a bottle of Olopatadine Hydrochloride Nasal Spray, if you do not use it for more than seven (7) days, you will need to prime the pump again two (2) times before use. 3. Gently blow your nose to clear the nostrils. Close one nostril. With your head tipped down (chin toward chest), place the nasal applicator 1/4 to 1/2 inch into a nostril. 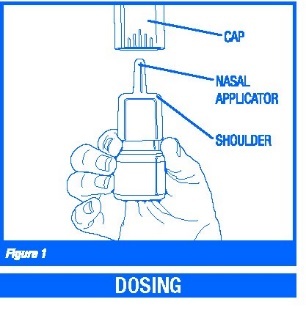 Hold the medicine bottle upright with the nasal applicator tip aimed toward the cheek side of the nose, away from the center of the nose (Figure 3). 4. Breathe in gently through your nose. 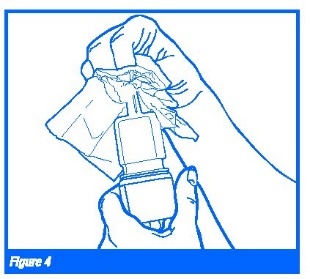 While breathing in press firmly and quickly on the applicator to release the spray (Figure 3). 5. Breathe out through your mouth. Do not tip your head back or blow your nose right after using Olopatadine Hydrochloride Nasal Spray. This may cause you to get a bitter taste in your mouth. 6. Change between the nostrils (alternate). Spray two sprays in each nostril. 8. This nasal device should be discarded after the labeled number of sprays (240) or after the expiration date on the medicine label or box. 9. Do not take extra doses or stop taking Olopatadine Hydrochloride Nasal Spray without talking with your doctor. 4. Shake the applicator to remove any water and put the applicator back on the bottle. 5. Prime by spraying two (2) times or until you see a fine mist. 6. Repeat the above steps if needed. Store Olopatadine Hydrochloride Nasal Spray between 39° to 77°F (4° to 25°C). Do not use your Olopatadine Hydrochloride Nasal Spray after the expiration date on the label or box. Keep Olopatadine Hydrochloride Nasal Spray and all medicines out of the reach of children. For more information about Olopatadine Hydrochloride Nasal Spray call 1-800-757-9195. Inactives: dibasic sodium phosphate, sodium chloride, edetate disodium, sodium hydroxide and/or hydrochloric acid (to adjust pH), and purified water. Each spray delivers 665 mcg olopatadine hydrochloride in 100 mg of solution equivalent 660 mcg olopatadine (as base) from nasal applicator. Important: Pharmacist dispense with enclosed patient instructions for use. Prime pump prior to initial use with 5 sprays or until a fine mist appears. Usual dosage: Adults and adolescents 12 years and older: 2 sprays per nostril twice daily. Usual dosage: children 6 to 11 years: 1 spray per nostril twice daily. 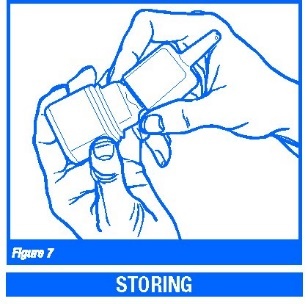 Storage: Store at 4°-25°C (39°-77°F). Batch / Mfd. / Exp.